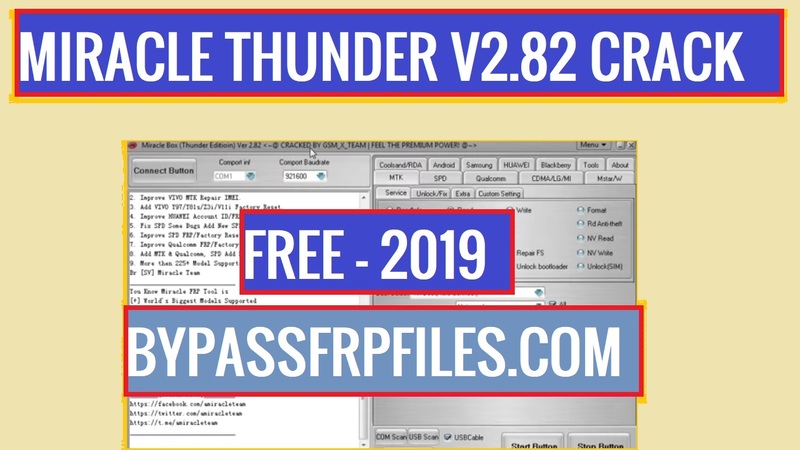 Finally, we found the latest version of Miracle Thunder 2.82 With Loader version for free so here we share with you that one so now you can use Miracle 2.82 Crack very easily, Miracle Thunder 2.82 crack now comes with a lot of features and supported almost all latest Android devices very easily. so if you want to download that’s one check out below and then you will get the download links of Miracle Thunder 2.82 With Loader. -Added Oppo A71, Vivo Y69, Oppo F5, Oppo F3, Vivo Y83, Y66, in MTK tab. -Qualcomm added Xiaomi and Micromax and Other latest devices for remove frp and do too many other things. -Fix MTK Unstable port problem. -Fix SPD not working problem. -Added new FRP tool for all Android. -Support some latest Samsung devices. -Added remove lock screen in many oppo and vivo devices. -First of all, download the Miracle tool to your PC first. -After that, extract the tool on your PC. -Then open the extracted Miracle tool folder. -Now there you will see “Miracle 2.82 Crack.exe”. -Then run the “Miracle Crack tool” from there by double clicking on that icon. -Go to back to desktop screen, then there you will see a new icon will added just click on the new “Miracle Thunder 2.82 crack .icon “. -Then run the tool as administrator permission. -Ok wait for a few sec to launch the tool. Note:- It will need some time to open Miracle Thunder 2.82 With Loader. -Once opened the tool now you can try this tool for repair your device. If you have any problem with Miracle Thunder 2.82 With Loader version then comment us below we will solve your problem as early as possible.